Context: This 88-day experiment evaluated the rearing performance of juvenile rainbow trout (Oncorhynchus mykiss) fed one of three isonitrogenous and isocaloric diets and reared at velocities of either 2.3 or 18.7 cm s-1. Objective: Evaluate the effects of diet and exercise during rainbow trout rearing. Design: Fishmeal was the primary protein source for one diet, with bioprocessed soybean meal (BSM) replacing either 60 or 85% of the fishmeal in the other two diets. Setting: This study was performed at Cleghorn Springs State Fish Hatchery in Rapid City, South Dakota, USA. Results: At the end of the experiment there were no significant differences among the dietary treatments in gain, percent gain, specific growth rate (SGR), or percent mortality. 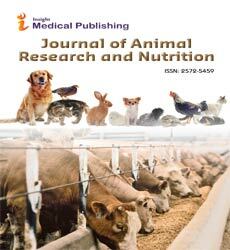 However, fish fed the fishmeal-based diet ate significantly more, experienced a significantly higher feed conversion ratio (FCR), and had a significantly higher hepatosomatic index than the fish fed the 85% BSM diet. Intestinal histology was not affected by the inclusion of BSM. Fish reared at 2.3 cm/s-1 had significantly lower FCRs, gain, percent gain, and SGR than the fish reared at 18.7 cm/ s-1. There was a significant interaction in food consumed between diet and velocity, but no other significant interactions between the dietary and exercise treatments were observed. Conclusion: Based on these results, BSM can replace at least 85% of the fishmeal in juvenile rainbow trout, even if the fish are exercised.